Thanksgiving is one of my favourite times of the year. I love getting together with family and friends and enjoying a traditional meal of turkey, stuffing, cranberries, roasted potatoes, maple-glazed carrots, and of course, an Autumn dessert. This year I wanted to go beyond the usual pumpkin pie and end the feast with an unconventional sweet finale. I decided to make a carrot cake, but one with a tropical twist. It consists of four thin layers of pineapple-infused carrot cake sandwiched between an ample serving of coconut cream cheese icing. 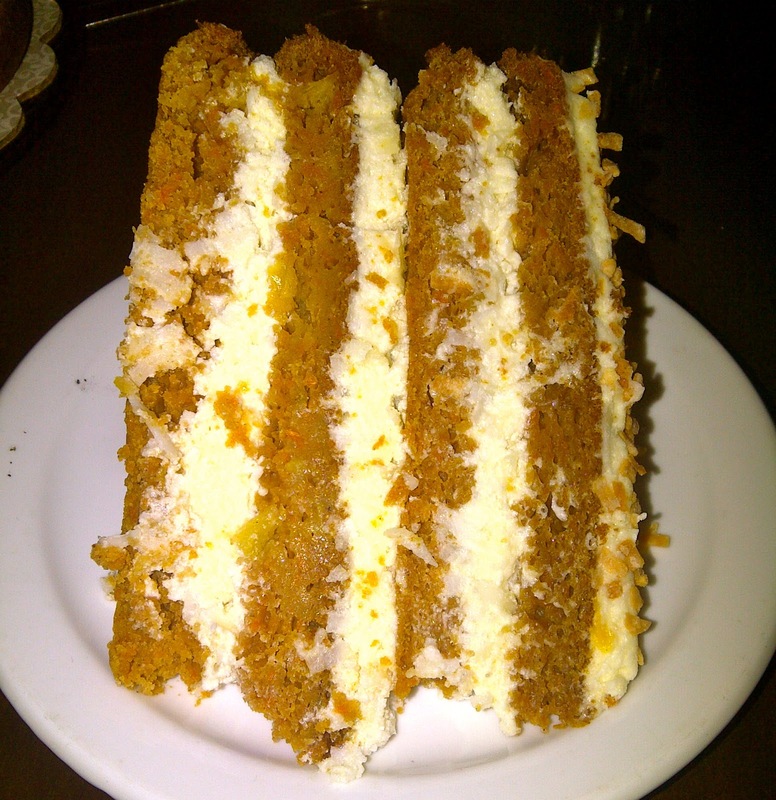 Unlike other carrot cakes, however, this one does not have any nuts, and instead is packed full of fresh-grated carrots, brown sugar, cinnamon and nutmeg, among other things. The cake is very moist and has a soft, dense texture. It makes a great finish to a classic Thanksgiving dinner. Preheat oven to 350° F. Spray or oil two 9-inch round cake pans. Finely chop drained pineapple, place in a sieve and press with a spoon to remove as much juice as possible. Grate carrots using a food processor. Measure out 4 cups and set aside. Place butter in a large mixing bowl and beat with an electric mixer until creamy. Gradually beat in sugar, then beat on medium for about 3 minutes. Beat in eggs, then vanilla. Beating on low speed, add about a third of flour mixture and beat just until mixed, followed by half the milk. Repeat additions, ending with flour. (The batter will be very thick). Gradually mix in pineapple and carrots. Divide batter between pans and spread to pan sides. To remove air pockets, bang pans on counter 5 to 6 times. Bake until centres seem set when lightly tapped, from 40 to 45 minutes. Place on a baking rack to cool. After about 15 minutes, turn cakes out of pans and cool completely on racks. 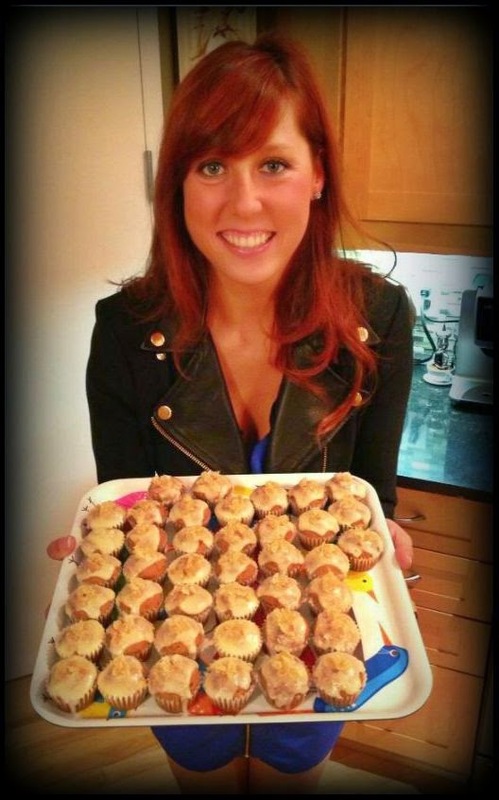 It’s best to bake cakes a day ahead of icing and leave at room temperature overnight. Place butter in a bowl and beat with an electric mixer until creamy. Beat in sour cream and vanilla. Cut cream cheese into chunks. Reduce speed to low and beat in cream cheese, piece by piece. Add about a third of the icing sugar and beat on low until just mixed in. Scrape sides of bowl and beaters occasionally. Gradually add remaining sugar, beating just until smooth. Make sure not to beat too much, as this will cause thinning. If too thick or thin, work in a little sour cream or sugar. Remove about a quarter of the icing to be used on top cake layer and set aside. Stir coconut into the remaining icing. Slice cakes horizontally in half. Place top of one cake, dome-side down, on a platter. 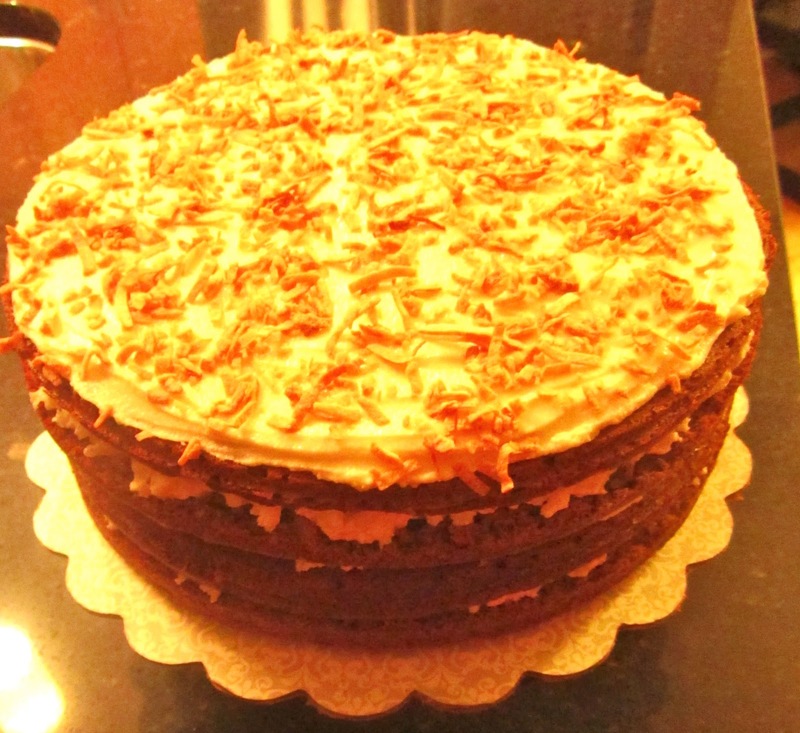 Spread with a third of the coconut icing leaving a narrow border of cake around edge. Lay the bottom of that cake, cut-side down, on top. Spread with half the remaining coconut icing, leaving a narrow cake border. Top with the bottom half of the second cake, cut-side down. 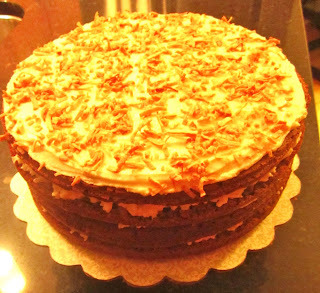 Spread with the remaining coconut icing, leaving a cake border. Top with the final layer, cut-side down. Spread with plain icing right to the edges. Garnish with toasted, fresh coconut. You can toast flaked coconut on a baking sheet at 350° F for about 12 minutes, or until golden brown. Best to refrigerate several hours or overnight before serving.